ref: this cookie is used to store the bitcoin address of the person who suggested you to visit our site. 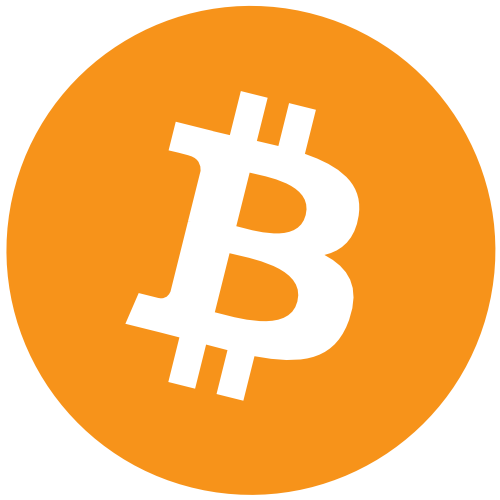 Thank to this cookie when you use our faucet rotator referral commission will be paid to your referrer when you get free bitcoins from the faucets. This website uses Addthis to allow people to share the pages of this website to other people. In this guide we will show you how to mine litecoin with Bitcoins43 free litecoin miner. Please, be aware that you need a Litecoin wallet first to start mining Litecoin. If you don’t have one yet, please read this guide to create it. First of all, open the free LTC miner of Bitcoins43. Then, scroll down until you find the login section, insert the address of your litecoin wallet and click the “Login” button. 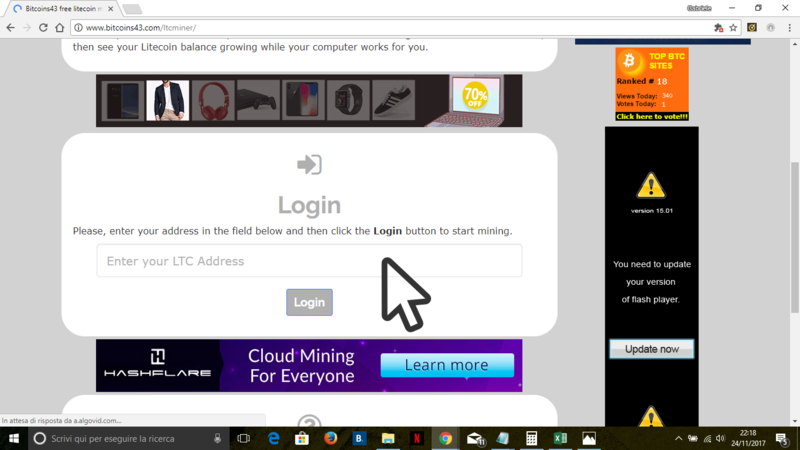 After that you will be redirected to the miner page where you can start mining Litecoin. 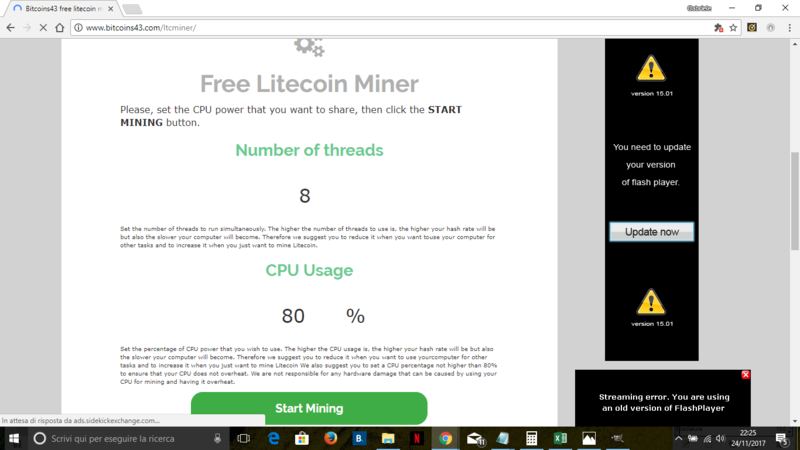 Set the mining parameters (number of threads and CPU usage) as you prefer following the instructions shown in the miner page then click the “Start Mining” button. 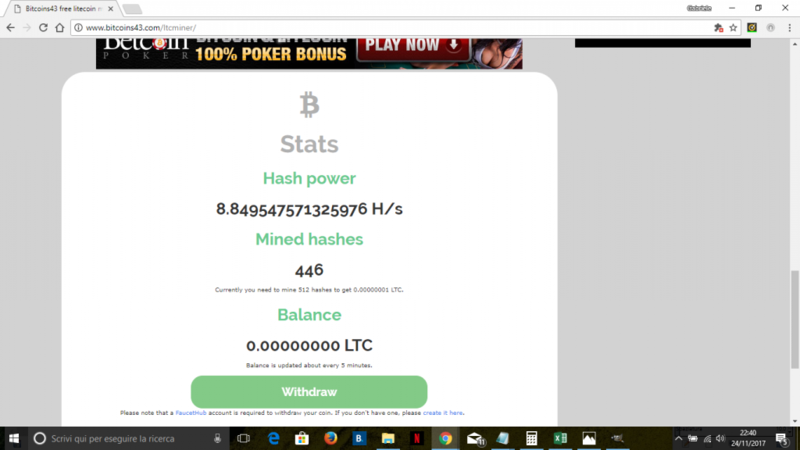 After that you will see that the miner has started working and you can see the mining stats in the “Stats” section of the page. Once your balance reaches 0.000001 LTC (100 Satoshi) the “Withdraw” button will be enabled and you will be able to withdraw your balance to your Faucethub account. Mining Litecoin has never been so easy, isn’t it?